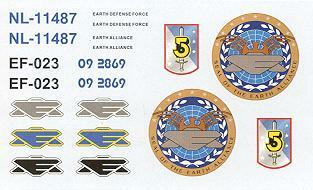 Babylon 5 was one of the most successful TV sci-fi series ever done. It was designed to be as a novel with each episode playing on the previous ones. It was also limited to a 5 year run from beginning to end. The show also spawned a sequel that only ran 12 episodes. Despite this sequel's popularity, the timing of it was poor and by the time a network decided to act on it, the actors had moved on to other projects. However B5 remains extremely popular, even in syndication. What is best about the series for modelers are the plethora of neat spacecraft that were spawned by the show. 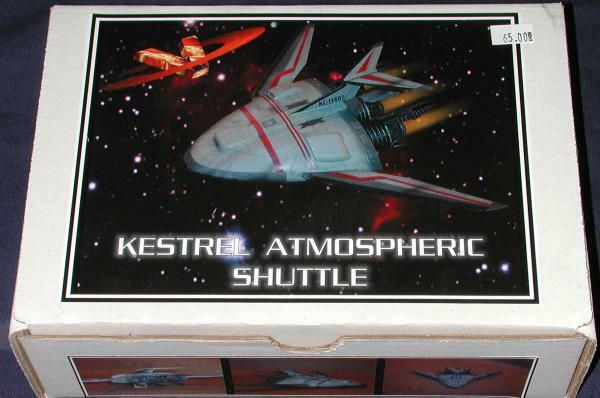 Revell produced a B5 station and a Star Fury kit, but never went any farther than that. It has been up to the resin folks to produce the rest of the ships. I've always been taken by the B5 shuttle. It has a neat combination of spacecraft and aircraft that I find quite alluring. When cruising the stalls at Wonderfest 2002, I came across this kit and knew that I had to buy it. 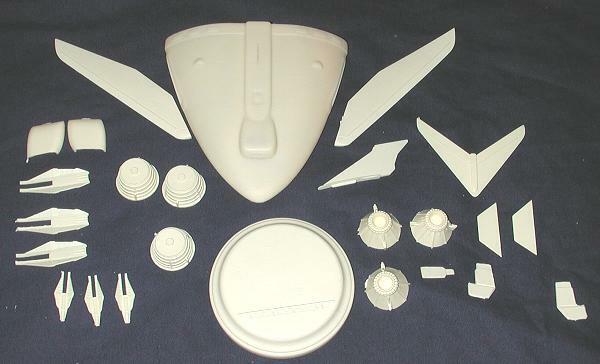 One of the first things you notice about the kit is that the fuselage is not a solid piece of resin; it is hollow. A rather ingenious way of producing a large cast part without having the tremendous weight that often comes from a big chunk of resin. You also notice that there are no landing gear. These are offered as optional extras for another $10.00. Now I'd have though that something like this would be included in with the kit, but apparently not. I optioned out of them as my intent is to build the kit in flight. As you can see from the image, there are not a great number of parts for this kit. I was able to test fit a number of the bits and found that even in the raw state, many of them fit quite well without any trimming. The overall quality of the resin casting is good, but not great. There is the usual small amounts of flash and some of the larger pieces are not as smooth as I'd like, however nothing that a bit of fine sandpaper cannot cure. I also found a pinhole in a few places, but this is to be expected. A nice touch is a solid resin base. I'm not sure just how I'll attach the model when done, but I'll undoubtedly think of something. Instructions are absolutely first rate. They include photographs of each of the major construction steps, though to be hones, they could have eliminated half of them as the kit is pretty intuitive for a number of steps. There is a painting scheme on the last sheet and you can use the box art and sides for more information regarding decal placement. There is a small decal sheet that offers three different options. The decals look well printed and appear to be on a continuous carrier film so I'll guess that they were done on an Alps printer. You can do either an Earth Defense Force or Earth Alliance ship and if your fancy takes you there, it can be modified for just about any other purpose you wish. For more info, I'd recommend watching B5 reruns for more specific details. This really is a quality resin kit. The parts are well formed, there is minimal flash or resin stubs, the instructions are good and it comes with a nice set of decals. It would have been nice to have had landing gear included in with the kit instead of an aftermarket item and additional expense, but the builders chose not to do so. If you have a penchant for things B5, then I can recommend a web search to find who carries the kit. Many enjoyable hours in front of the television. Yet another kit purchased for your reviewing pleasure. If you would like your product reviewed fairly and quickly where it will be seen by well over 150,000 visitors a month, please contact me or see other details in the Note to Contributors.